GS… First of all, we´d like you to introduce yourself, Erin. ¡Hello! I am Erin or by my geocaching name, Oceansazul. I started geocaching in 2011 when a friend took me out to try it. I immediately was hooked and have been geocaching since. I started working at Geocaching HQ in 2015 as the Guest Experience Coordinator and spent almost two years hosting geocaching visitors from all over the world who came to visit us here at HQ. I recently moved to the Community Volunteer Support role and am excited to work with all of the game’s volunteers. My work is focused on supporting volunteer translators and I am very excited about this. I have worked as a translator in the past. (I speak Spanish fluently, Portuguese moderately, and dabble in a few other languages as well). I love to travel, find geocaches along the way, and I love to laugh. GS… ¿Actually…How many cats do you have really? Just one. I never had a pet in my life until last year when I finally decided to try having a cat. His name is Rutabaga Jones, Rudy for short, and he is very beautiful. GS… ¿How did you meet Geocaching? As I mentioned, I started geocaching when a friend took me in 2011. The first container we found was a small lock and lock. My friend promised me there were a lot of really cool containers out there and made me try another. The second cache we found got me hooked. It was a very well camouflaged container connected to a tree. I thought it was so cool! GS… ¿And how did you start to work for Groundspeak Inc.? I grew up in the Seattle area and was looking for a new job. A friend pointed out the job posting and I thought it looked like a really great fit for my skills and my love of the game, so I applied. I am very grateful they picked me! GS… ¿Who are the people on the HQ team, and which function have each of you? There are about 75 staff who work at HQ across 15 teams. A lot of these teams work on technical aspects of the game, such as IT, web development, API and database management, mobile development, etc. Other teams work to support and engage with the community. My team, the Community Volunteer Support Team (CVS for short) works to support the global community of volunteers, including reviewers, Geoawares, translators, and forum moderators. GS… ¿How did HQ Team lived the 3m hidden geocaches milestone? Hitting 3 million hidden geocaches was a great milestone for the whole geocaching community. We also celebrated with a cake! GS… You´ve been 2 years managing the GIFF. ¿Could you explain its evolution since it began in 2013? The Geocaching International Film Festival began in 2013 and was a part of the Geocaching Block Party 2013 held at Geocaching HQ. The finalist films were screened in a park near HQ and it was a huge success. So, there was another GIFF in 2014. The finalist films were shown again in the park near HQ. Well, in 2015, all of the finalist films were ready to go but it was pouring down rain, like it sometimes does here in Seattle. The GIFF team decided on a fabulous alternative plan. They allowed geocachers across the world to host GIFF events to show the film reel and the community loved it. In 2015 there were 449 events in 46 countries. In 2016 there were 526 events in 44 countries. And this year, hopefully there will be even more! Los eventos GIFF se celebran entre el 2 y el 6 de Noviembre de 2017. GIFF Worldwide Film Screening events are held November 2-6, 2017. To learn more about hosting or attending a GIFF event, you can visit the GIFF webpage..
GS… ¿Could you tell us any surprise or new stuff for this year´s GIFF? It is very exciting to see all the great video submissions coming in. I am surprised how many geocaching time travellers are out there! Also, I LOVE the gnome “artist” micro coins and the film reel geocoin in this year’s GIFF merchandise collection. GS… This year´s image is quite the same on the GIFF, we mean, it´s just changed the colour (from blue to red), and the things surrounding the main icon, but we still have the little dwarfs. Why this image? From the start, GIFF has been a whimsical, creative, and fun promotion. Gnomes are creative and whimsical, right??? GS… GIFF 2016 organized in Spain were such a hit, we even heard voices claiming for a Mega. Do you think this is possible? ¡I would love to see a GIFF Mega Event happen somewhere in the world! Let’s see who can get 500 attendees! GS… ¿What are the criteria for a video to be nominated as finalist? Had you ever discarded a very good history because the video quality was just quite low?. If so, have you told this person to try to repeat the video with a better video quality? We recognize how challenging it is to tell a story, through video, in 4 minutes or less. But that is what we are looking for - a great geocaching story. We understand if geocaching comes before filmmaking on people’s hobby list—we're not looking for Hollywood here. We are, however, looking for videos that will look and sound good on the big screen. 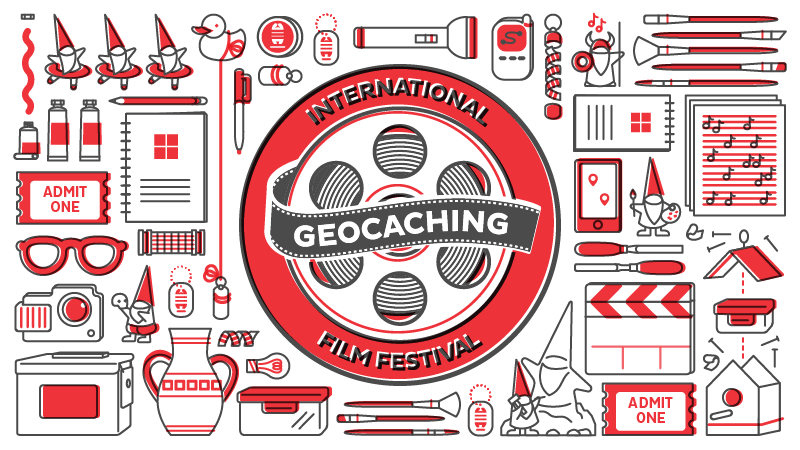 We review production quality, content, creativity, and the contribution the films make to the global geocaching community. We have some great tips for submitting a film on the GIFF website. GS… We´d like to know better the HQ. Could you suggest someone else to interview? What would you ask? I think a great team to ask would be our Community Engagement team. They could answer a lot of your questions originally written here for Alex regarding the Blog, Newsletter, Geocache of the week etc. GS… Thank you very much for your time and we hope that this interview helps to bring the Geocaching community in Spain to the "Geocaching HQ". – Define yourself in one word That is too hard! – Your biggest defect I don’t have any! – Favourite hidden cache I only have one physical hide, so that one! I also really enjoy hosting CITOs though. – Favourite found cache Too many to count but I love EarthCaches and gadget caches. – A film from all the GIFF I can’t pick just one!!!!!!! – Talking about geocaching, you can´t stand... I know some people like them but I can’t find caches in rock walls. I have tried, sometimes for a really long time, multiple times. I just don’t see them. Now I avoid them. – Other hobbies besides geocaching I grow dahlia flowers, love to read and I love to cook.